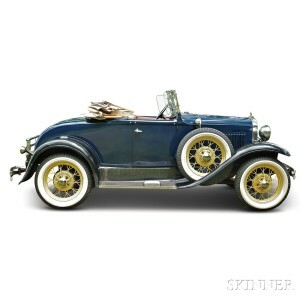 Vintage Automobiles Cross the Block at Skinner August 8 | Skinner Inc.
Marlborough, MA – July 31, 2015 – Skinner, Inc. will present an eclectic group of automobiles to open its summer American Furniture & Decorative Arts auction on August 8th in Marlborough, MA. 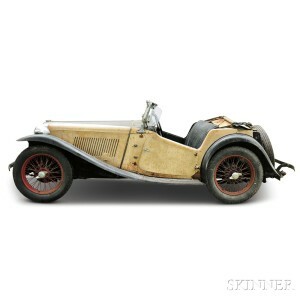 The six vehicles on offer, produced between 1930 and 2002 by both domestic and foreign manufacturers, will appeal to a broad range of discerning antique and special interest car collectors and enthusiasts. The first two lots to be offered are iconic examples of “Detroit iron.” Lot 1, a 1930 Ford Model A Deluxe Roadster (Estimated between $14,000 and$18,000), is in remarkable condition for a “barn find,” as only fresh gasoline, a new battery, and a new starter motor were needed to return the car to running condition. Its straw yellow wire wheels offset a dark blue body and black fenders, a striking combination. A white 1965 Ford Thunderbird (Lot 2, $12,000 to$18,000) with an immaculate blue interior and a rebuilt engine looks and drives as if it were new. Featuring a full back seat, Thunderbirds of this era make excellent collector cars for families, and this example would look great either at a car show or at the local ice cream stand car meet. A 1948 MG TC Roadster (Lot 3, $8,000 to$10,000), was found in the same barn which housed the 1930 Ford Model A. While essentially complete, this MG is a project car and is not running. It was brought to this country within a few years of its manufacture and, like the Model A, descended in the same family, to be presented directly from the barn to the buying public. A much more refined and luxurious sport coupe, the low-mileage 1987 Mercedes Benz 560SL on offer (Lot 4, $14,000 to $16,000) is in impeccable condition, having always been garaged and carefully maintained. In striking red with a camel interior, this car retains both its hardtop and soft top and delivers both strong performance and a beautiful ride. For collectors looking for even more raw power, two offerings by the iconic Italian manufacturer Ferrari will be included in the sale. Both of these low-mileage cars are from the maker’s 360 series, and both wear the classic Italian racing red. The convertible version on offer, a 2002 360 Spider (Lot 5), carries a pre-sale estimate of $65,000-$75,000, while the coupe body style is represented by a 2000 360 Modena (Lot 6, $45,000 to $50,000). Both of these striking high-performance automobiles exemplify the finest in design and speed. Previews of the automobiles to be sold at auction will be held at Skinner’s Marlborough gallery on Friday, August 7th, from noon to 8PM, and Saturday, August 8th, from 9AM to 10AM. The illustrated Catalog for sale #2838M is available from the Subscription Department, at 508-970-3240, or from the Gallery. Prices realized will be available online, at www.skinnerinc.com, both during and after the sale. The Skinner website enables users to view every lot in the auctions, leave bids, order catalogs and bid live, in real-time, through SkinnerLive! and Bidsquare. Skinner auctions draw international interest from buyers and consignors alike, with material regularly achieving record prices. The company’s auction and appraisal services focus on fine art, jewelry, furniture, and decorative arts from around the globe, as well as wine, fine musical instruments, rare books, Asian art, clocks, Judaica, and more. Monthly Skinner Discovery auctions feature a breadth of estate material. Widely regarded as one of the most trusted names in the business, Skinner appraisers have appeared on the PBS-TV series, Antiques Roadshow, since the show’s inception. Skinner has galleries in Boston and Marlborough, Massachusetts, and offices in New York City and in Miami, Florida. Bidders participate in person, by phone, and online; join auctions live with SkinnerLive! and Bidsquare. For more information and to read our blog, visit the website at www.skinnerinc.com, find us on Facebook, or follow us on Twitter. This entry was posted in News and tagged antique automobiles, antique cars, antique vehicles, automobiles, cars, collectible automobiles, collectible cars, collectible vehicles, Ferrari, Ferrari Convertible, Ford Model A Deluxe Roadster, Ford Thunderbird, Jane Prentiss, marlborough, Mercedes Benz, MG TC Roadster, skinner, skinner auctions, vehicles by Skinner. Bookmark the permalink.